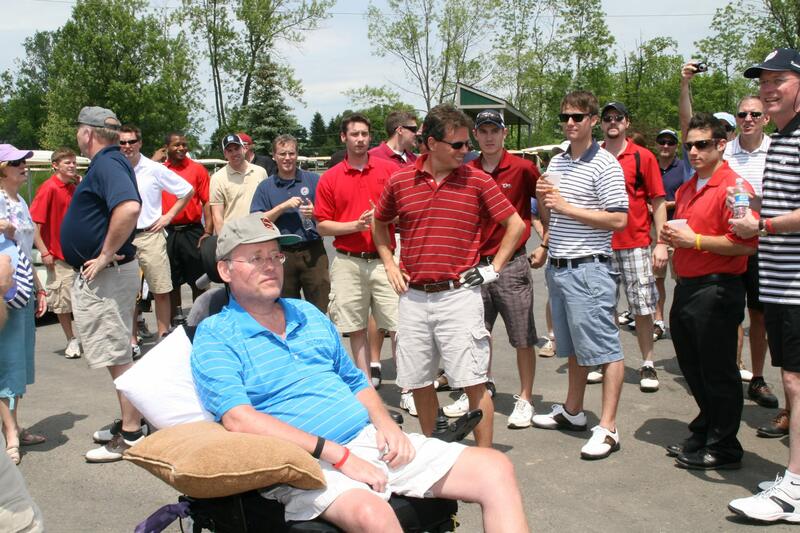 Starting with the first tournament on June 6, 2009, The Brendan "BD" Donohue Memorial Golf Tournament raises funds to benefit the ALS Association of Upstate NY. The monies raised each year at this event assists the ALS Association in their mission to provide essential medical equipment to patients, host support groups across Upstate New York, supply monetary grants that provide caregivers respite, fund important research, and effect legislation to advance patient priorities through national advocacy. Two years later in 2011, the Brendan Donohue '84 Memorial Scholarship Fund at Clarkson University was established and this event now supports both of these great causes. This past year's 10th Annual Brendan Donohue Memorial Golf Tournament raised over $22,000 combined for the ALS Association of Upstate, NY and the Brendan Donohue '84 Memorial Scholarship Fund at Clarkson University. Total funds raised over the last 8 years for the ALS Association and the Memorial Scholarship Fund is over $195,000. At last year's event we had 80 golfers participate and 100 golfers, friends and family, and TDK Brothers attended the Awards Dinner. This year's Title Sponsor was once again Spotted View Minature Horses, LLC. To find out more information or to contribute to the Brendan Donohue Memorial Scholarship fund please click on the "ALS and Scholarship Fund" TAB located on the left side of this page. For Sponsorship opportunities please click on the Sponsorship Tab on the left of this page. Please join us for our 11th Annual Brendan Donohue Memorial Golf Tournament to be held Saturday June 1, 2019 at The Links at Erie Village. Please click on "The Course" for course information and directions.